This unique diamond eternity ring features 20 hand selected diamonds set in round and square bezels. 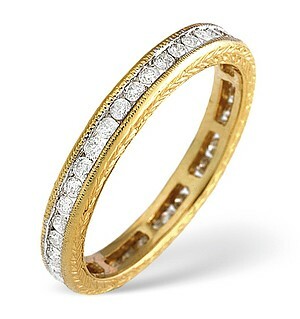 The round brilliant-cut and princess-cut diamonds are perfectly set in highly polished 18k gold or platinum. The diamonds, total weight 0.38ct, are available in your choice of clarity. Tanzanite (2.25 Ct) 14K Y Gold Ring (Size O) 2.250 Ct.